It’s important to constantly evaluate and optimize your best social media content to ensure your feeding content into an engaged and active audience. Whether you’re a large brand or a blogger, if you’re spending time creating and sharing content no one is interested in, well, you’re just waiting your time! Avinash Kaushik’s four major social media metrics were designed in a 2011 blog post to address the way in which we evaluate our social media performance. Both Moz and Buffer use Kaushik’s social methods within their social media marketing, and theres an analytics tool, True Social Metrics, based solely upon his metrics. 1) Conversion Rate: The number of conversations per post. For example, on Facebook, Google+, LinkedIn (comments), on Twitter (replies). 2) Amplification Rate– The number of reshares or retweets per post. 3) Applause Rate- The volume of ReTweets, Likes, +1’s, and so on. 4) Economic Value– The sum of short term revenue, long term revenue, and cost savings. The release of expanded twitter analytics which now allows you to easily view impressions, engagements, engagement rates, and much more information for free. 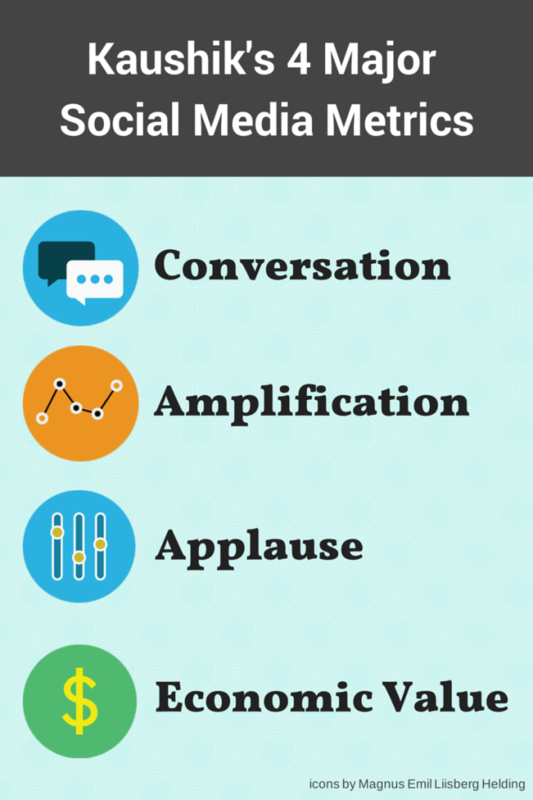 Social Media Examiner shared a comprehensive excel spreadsheet for evaluation and optimizing social media content. The spreadsheet includes 14 different variables for each social media post including likes, shares, clicks, engagement and more. Buffer allows you to stack social media updates across Facebook, Twitter, LinkedIn and other platforms and gives fantastic free analytics on retweets, mentions, favorites, clicks and more, as well as recommendations as to when to schedule and optimize content. In my opinion the economic value is the hardest part to track within Kaushik’s metrics. At work we use a BitLy Google Analytics shortening tool from Setaris which allows you to measure specific keywords and campaigns through to conversions easily within google analytics, and shorten and track your links posted as well. It’s important to consider Kaushik’s four metrics, and review and evaluate your social media content to ensure it’s always optimized and functioning well. if you’ve got a tool or article you’ve read which has more information or insight, please share within the comments, or send me a tweet @MarissaPick. Thanks! 1) Using social media for selling, not conversing or engaging: Social Media is a place to build a personality and enhance a deeper relationship with your audience. Social media users often don’t respond well to a hard sell. Make sure your social media is a channel for starting a conversation, and engaging with your audience. Building up trust and a repertoire is crucial and from there the only thing you need to sell your customers on is that you’re going to include them in the conversation. 2) Avoiding Controversy and Complaints: Let’s face it, social media is the perfect channel to vent and let our frustrations out. Mistakes happen and as a brand you need to own up to them and let your customers know what you’re going to do to ensure they won’t be repeated. Ignoring complaints shows you’re going to do your own thing, and that as a brand you are backing away. Own your mistakes and man up! Make sure you have a plan in place for worst-case scenarios, and a social media disaster, it can’t hurt to be prepared! 3) #Getting #Hashtag #Happy on #SocialMedia: Using hashtags is a handy and effective tool, however sometimes they need to be used in moderation. Using too many hashtags within a tweet or an Instagram post can come off too pushy. We’re already limited to 140 characters on Twitter so utilizing an image and text should speak volumes and stand alone, with a hashtag as a supporting entity. Hashtags are fantastic for running promotions and enhancing searchability, however when used too often they can limit your ability to really amplify your message. 4) Lacking a Strategy with Clear Business Objectives: If you’ve ever read my blog you’ll understand that i’m a firm believer in understanding that what you decide to do is JUST as important as deciding what you’re not going to do. Make sure your brand has clear objectives set for utilizing social media, with a strategy for each social channel to help you achieve your goals. Creating a strategy should include having distinct and measurable goals, thinking through your brand’s voice, and planning out a content calendar with clear goals in mind. Setting a strategy and agreeing upon clear business objectives are the first two step’s in social media success. 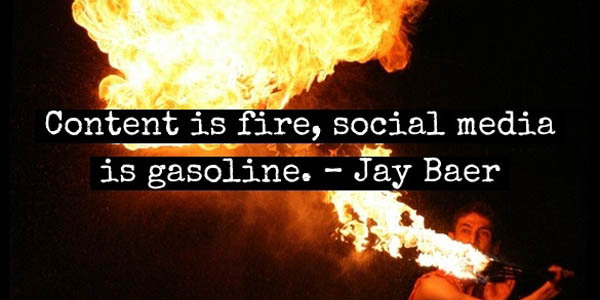 It’s no surprise that as we enter into 2014 we’ve seen a social media explosion. Now there’s over 800 million people connecting with each other on social media networks including LinkedIn, Twitter, Facebook, and many more. I had the privilege of joining Sarah Lawrence, senior associate, DLA Piper; Lucy McNulty, managing editor, IFLR; and Callum Sinclair, partner, DLA Piper on a webcast run by International Financial Law Review (IFLR) and sponsored by DLA Piper on using social media to further your career. This webcast was the first in IFLR’s Women in Business Law Group’s webinar series. We each explained our experience and insights into how the rise of social media has fundamentally changed, and how we each communicate within our professional worlds. At the bottom of this post is the slide share of the powerpoint deck we used during our presentation, and if you would like to access and listen to the webinar broadcast please visit this link. During the Q&A portion of the webcast, one of the questions directed to me focused on best practice for the use of social media platforms. Below are my top ten tips for utilizing social media to advance your reputation and further your career.. Stand out within your social media profiles. On twitter you have only 140 characters to tell the world who you are, so make your profile catchy and interesting. Although this seems basic, many profiles across social media are missing photos, contact information, and other crucial data. Highlighting your interest, job duties, location and other keywords helps people find out more about you. In addition, consider cross promoting your other social media platforms as well to boost your digital footprint. If you want to be taken seriously online, including a link within your profile is encouraged; for example feature your LinkedIn profile within your twitter bio to make easy for people to connect with you. Lock It Down. What happens online doesn’t stay online. We live in a world within limited privacy, so as your setting up your social media profiles make sure to check your privacy settings and ensure they’re set properly. As employees we are a representation of the company which employs us, so remember to think before you post, or you can be held liable. Transparency is key in building and maintaining a strong reputation. Be honest, respectful, and mindful across all social media platforms. It’s important to be open and transparent, this makes people relate to you. It’s important to align your online persona with your offline personalty to avoid trouble. Content is King. The key to any social media strategy whether you’re trying to advance your career or increase your businesses visibility should focus around a solid content marketing plan. What you share across social media platforms should be interesting and engaging for others to enjoy, read, and share. All social media platforms are not a one size fits all model, it’s important to craft posts for each social networks to maximize and leverage content. As a reminder content doesn’t always have to be original. Test quotes, statistics, and visual content and images across social media and see what works best. Incorporate Images. Visual social marketing is the next generation of social media. 90% of the information transmitted to the brain is visually based, and the human brains processes images 60,000 times faster than text. Utilize social media tools Instagram & Vine which let you embed posts and videos easily, and use free apps like Quoter which provide ready to go quotes, or let quickly create a visual image. Mix it up and create content that is visually pleasing and easily shareable. Become an authority and add value. Choose a focus, and share information relevant to your niche career area. Join LinkedIn groups, start discussions and comment on existing discussions, find and engage within Twitter chats, and most importantly always add value. As you engage more within social media you will gain the trust of others who will follow you to find information. As you focus and carve our a niche area, you will build trust, and people will begin to share your content and come to you for advice. Establish Yourself Offline. Establishing yourself as a brand both online and offline allows people to put a face to your name. Nothing takes the place of face to face interaction, so ideally building a strong online presence can translate to building a stronger and larger network of offline connections. Stay up on Digital Trends: Demonstrating your proficiency with all things digital shows you’re up on digital trends, which are currently affecting every company. Employers are increasingly looking for social media and digital proficiency in potential employees. Make time. Social Media is easy, but it does take time, carve out an hour a week at a minimum to go in spend within social media platforms. Setting up a social media profile is a great first step, but as with anything else it takes time and a comfort level to become successful. If you’re going to let your platforms sit and never update them, why bother even setting up a profile? Have Fun. Social Media is a great place to have fun and let your corporate hair down. Whether your using social media to advance your career, or build your business remember to utilize your profiles as an avenue to have fun! Please share your feedback below in the comments section, or tweet me @MarissaPick. I recently updated my Vizify twitter video, which creates an animated portrait of the users twitter account to include general stats (24% of my overall tweets were favorited) top photos, tweets, topics, and an overview of when the user tweets. Had to share- check it out- and make your own today!